Where is it suitable for hanging? ---The product has different sizes ,please choose the right size so you get the best decorative effect. ---This art is suitable for decorating hotels, restaurants, cafe, halls, living rooms and so on, also used as a gift . ---Your oil painting is protected on the corners with cardboard, shrink film wrapped, and packed in a carton box to ensure its safety during shipping. We stand behind our oil painting by offering you a 100% money back guarantee if you're not completely satisfied. If you for any reason are not pleased with any product by Metuu, please do not hesitate to contact us first and we will do our best to solve your problem ASAP! ---Please note that the pictures we show on Amazon are taken from real in our gallery.Since it is hand-painted,we can not confirm it is 100% as the pictures show when you get what you order. And color of pictures may vary by different monitor setting. Oil Paintings Size: 24*36 inch (60x90CM). 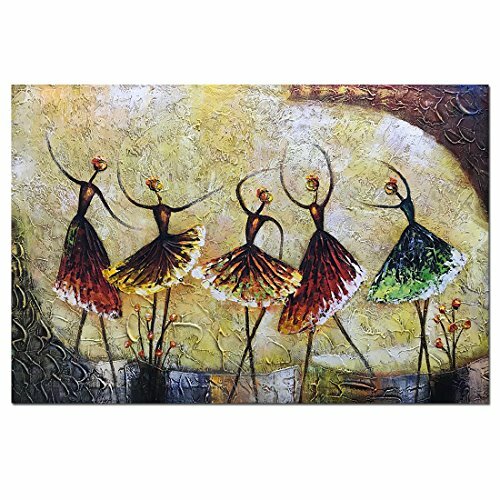 The oil paint features 5 girl dancing ballet. They were painted with splendorous colors and floral design that combines with the red (green) dress she's wearing. Good for gift: A perfect wall decorations oil paintings for living room, bedroom, kitchen, office, Hotel, dining room, bathroom, bar etc. A great gift for your relatives and friends. If you have any questions about this product by Metuu, contact us by completing and submitting the form below. If you are looking for a specif part number, please include it with your message.